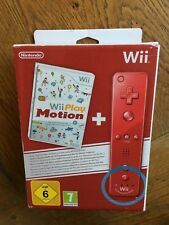 Wii Play Motion + Wii Remote Plus Red (open box) - Nintendo UK Contents Sealed! Contents flawless but missing the 2 x AA batteries. Includes all paperwork and instructions. Official Nintendo UK Release. 5 out of 5 stars - Wii Play Motion + Wii Remote Plus Red (open box) - Nintendo UK Contents Sealed! 1 product rating1 product ratings - Wii Play Motion + Wii Remote Plus Red (open box) - Nintendo UK Contents Sealed! Wii Remote with Silicon Sleeve. For Nintendo Wii. Region: PAL. The outer cardboard box has the most wear. KNOCKOUT PARTY. NINTENDO WII. NEW & SEALED CONDITION COMPLETE . Do you have what it takes to be crowned king of the show. THIS ITEM IS NEW AND UNUSED, IT IS NOT SEALED. The disc does have surface scratches but has been tested and is in perfect working order. Wii Play “Big Box Edition” including - Excellent condition official Wii remote with silicone sleeve and wrist strap. We Dare Flirty Fun For All [NEW & SEALED]. This is for use on Nintendo Wii. This item is New as in the photograph. Manufacturers part number : RVL-SLVP-UKV. Nintendo Wii. For the greatest show on the 3D Rendered Earth! very good condition – tested and fully working. Wii PLAY Solus. For Nintendo Wii. Before they can be sold, they must be tested: Only the best Squeeballs make it off the island. You are the tester. slice them, dice them, inflate them! Test them to destruction! Your task is to perform all the tests in a series of challenges. Knockout Party - Nintendo Wii. Let's Tap Big Box Limited Edition Pack (boxed complete) Nintendo Wii Excellent. Purchased new used a few times. Condition is Very Good/Excellent. Dispatched with Royal Mail 2nd Class flat packed. TESTED & WORKS PERFECT. BOXED WITH INSTRUCTIONS. Cocoto Magic Circus. This is for use on Nintendo Wii. This item is Used as in the photograph. Manufacturers part number : RVL-RMRP-UKV. And there's more! Platform: Nintendo Wii. Dance along to your favourite tunes. Select the mood of your party. Title:Wii Play. All of our paper waste is recycled within the UK and turned into corrugated cardboard. Your item will be previously owned but still in great condition. The disc will play perfectly without interruption and the case, inlay notes and sleeve may show limited signs of wear. Circus (Wii). Title:Circus (Wii). All of our paper waste is recycled within the UK and turned into corrugated cardboard. General Interest. Your item will be previously owned but still in great condition. Nintendo WII Party Solus. Title:Nintendo WII Party Solus. All of our paper waste is recycled within the UK and turned into corrugated cardboard. Your item will be previously owned but still in great condition. The item is in excellent condition. The booklets have never been removed and are in new condition. They are barely visible and the disc has no cracks and is fully intact. Mint = Perfect condition, looks unused. Near Mint = Almost perfect apart from a little blemish. Box - Excellent. Disc - Very Good. Very Good = What you would expect from normal use. Good = Not treated very well, but acceptable. Knockout Party (Wii). Title:Knockout Party (Wii). All of our paper waste is recycled within the UK and turned into corrugated cardboard. Your item will be previously owned but still in great condition. 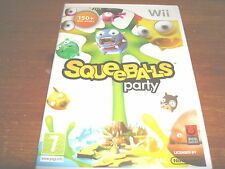 Squeeballs Party (Nintendo Wii). Title:Squeeballs Party (Nintendo Wii). All of our paper waste is recycled within the UK and turned into corrugated cardboard. Your item will be previously owned but still in great condition. 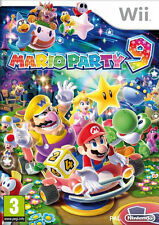 Nintendo Selects: Mario Party 8 (Nintendo Wii). 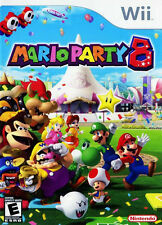 Title Nintendo Selects: Mario Party 8 (Nintendo Wii). Publisher: Nintendo. Baby Sloth Beaded Bookmark. Shoot For The Moon Beaded Bookmark. Classification: To Be Announced. Rayman Raving Rabbids 2 - Nintendo Wii (Boxed with Manual) **Free Postage**. Condition is Good. Dispatched with Royal Mail 1st Class Large Letter. But then, where's the fun in that?. SqueeBalls Party. Item condition - An item that has been used, but is in very good condition. 12 Helston Close. Once the party troupe is collected, the player can set the right mood by selecting one of the possible topics: Enchanted, persuasive, naughty, adventurous and clever. Can your teammates then guess?. The more people play the more funnier it gets. 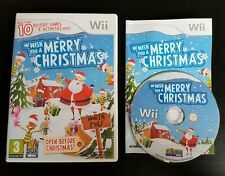 Wii - Family Party: Winter Fun (boxed) (used). Family Party: Winter Fun. Language is German. Pattern picture! Item may differ from the photo. The Konsolenkost-Team wishes you a lot of fun. boxed, used. Wii - Wii Party (boxed) (used). Language is German. Pattern picture! Item may differ from the photo. The Konsolenkost-Team wishes you a lot of fun. boxed, used. Item may differ from the photo. Our service for you! Wii - Knockout Party (UK Version) (boxed) (used). Knockout Party. Language is German. Pattern picture! Item may differ from the photo. The Konsolenkost-Team wishes you a lot of fun. UK Version, boxed, used.